Why do the Fairborn girls soccer players appear so mad? Despite solid play, they’ve lost their first two matches of the season by scores of 1-0. 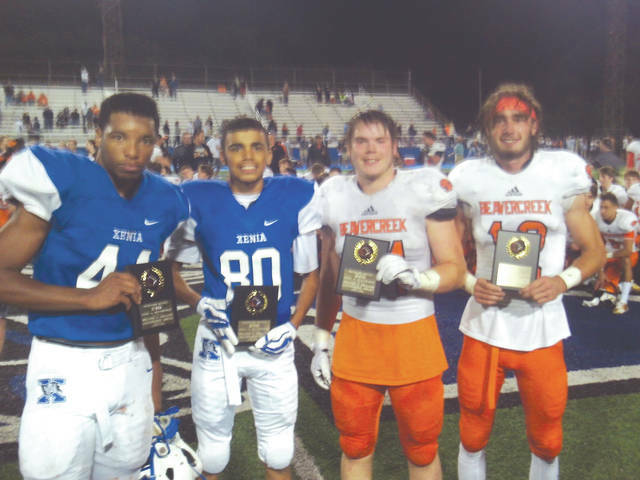 The annual Backyard Battle between high school football teams Xenia and Beavercreek will take place at 7 p.m. on Friday, Aug. 24 at Beavercreek’s Frank Zink Field. Here’s a submitted shot of last year’s top offensive and defensive players. 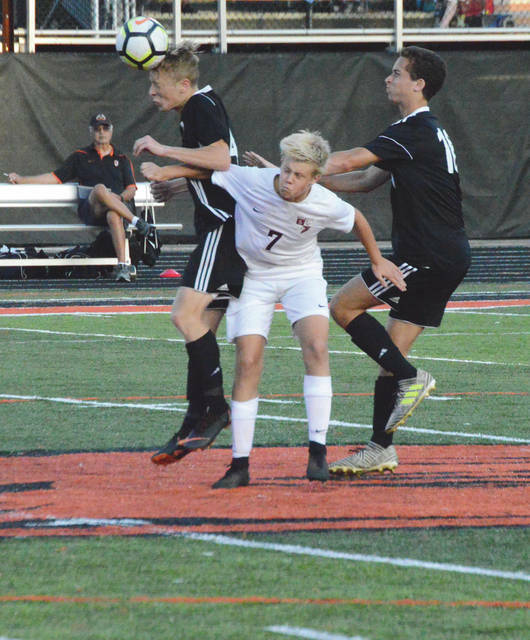 Beavercreek’s Pete Schneider heads a ball at midfield while colliding with Lebanon’s Mattias Lindberg (7) and Beavers teammate Christopher Borges, in a season opening boys high school soccer game, Aug. 21 at Frank Zink Field. 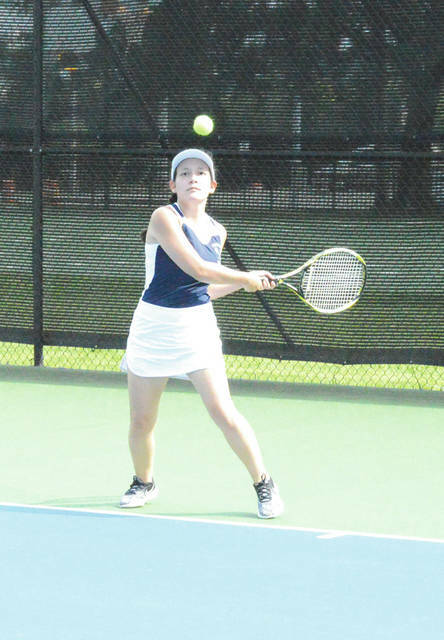 Fairborn’s Tianna Thomas keeps her eye on the ball, during a recent girls high school tennis match at Community Park against Greeneview. Greeneview football fans hope to see this scene a lot during the 2018 high school football season. 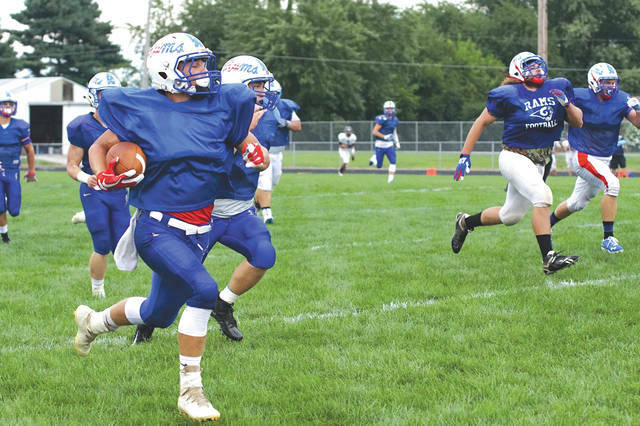 The Rams run for a big gain, Aug. 17 in a recent home scrimmage at Don Nock Field against Blanchester. Xenia’s Taylor Huffman outraces Lynchburg Clay’s Chelsea Hart for the ball during a recent girls high school soccer match at Doug Adams Stadium. Read wheel. Do what it says. 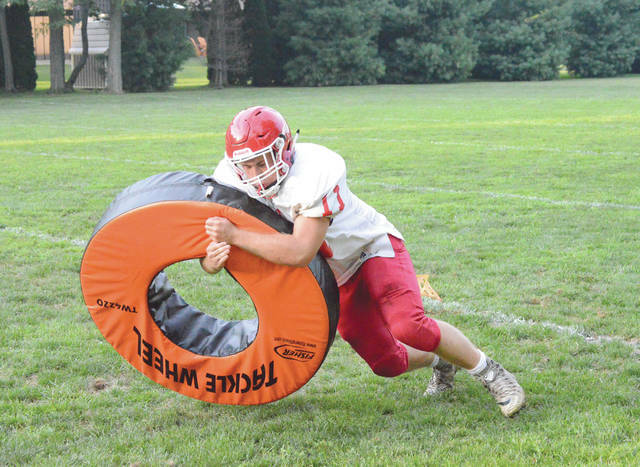 A Cedarville High football player works on his tackling form during a recent Indians practice. 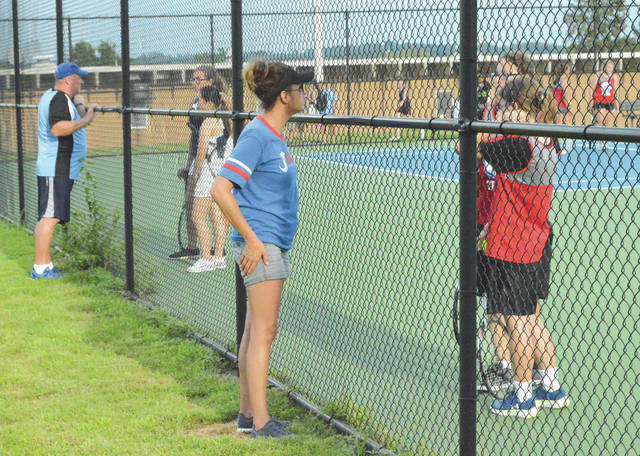 Greeneview coach Jami Sears (near) and Fairborn coach Doug Coy discuss strategy with their respective doubles teams during a break in a close match Aug. 10 at Fairborn’s Community Park. 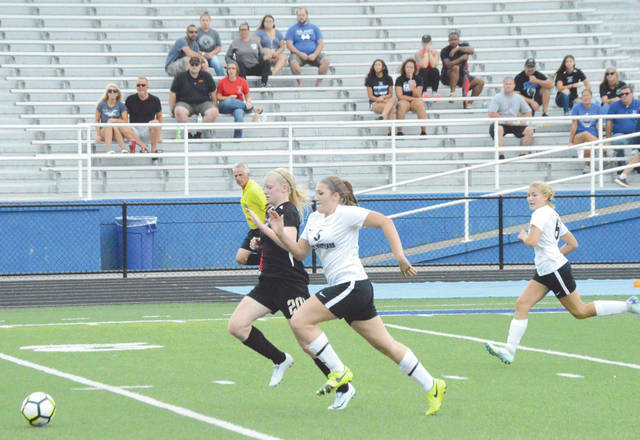 GREENE COUNTY — With football, boys and girls soccer and girls volleyball season all getting under way this week, the 2018 high school fall sports season is hitting full stride. Here’s a look at some of the photos we’ve received or shot from fall sports contests already this season. Send your photos to: sports@xeniagazette.com, and we’ll run the best ones in the newspapers and on our websites. Here’s wishing everyone a safe and enjoyable season.